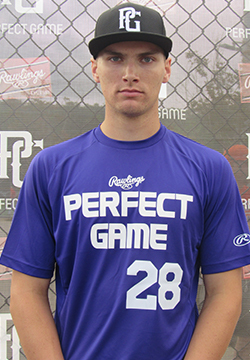 Patrick Norman is a 2019 SS/3B, OF with a 6-4 195 lb. frame from Murfreesboro, TN who attends Central Magnet School. Big and ultra projectable build. Athletic all around player who ran a 6.83 second 60 yard dash, 4.72 second home to first base time. Primary shortstop, takes short steps to the baseball gliding nicely to the point of gathering, hands work out in front, good arm strength across the diamond with the ability to throw from multiple arm angles, topped out at 84 mph from shortstop. Righthanded hitter, sets up with a high hand set and a high back elbow, takes athleticism into his swing, clean and smooth stroke with real bat speed, easy trigger to begin swing that gets him repeatedly on time to the ball, lots of strength present in the swing, consistent pull side hard hit baseballs that included a home run during round. Good student. Named to 2018 Sunshine Southeast Top Prospect List.